We've begun discussing things that can derail (see what we did there?) your power-rail measurements, such as the deleterious effects of RF interference. 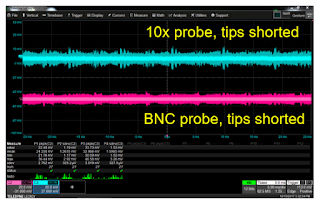 In the same context, one should always be mindful of certain characteristics of oscilloscope probes; namely, the 10X attenuating probes that are often lying around on the testbench. In our earlier discussion of RF interference, we were particularly interested in that phenomenon's effect on small signals, and used a 1.5-V battery as a simple power rail for measurement examples. 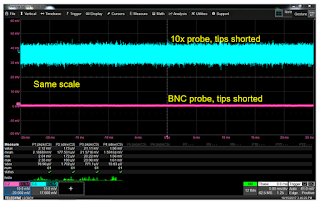 We got our best results using a BNC probe with a microgripper tip. What would be the effect of measuring that power rail with a 10X attenuating probe vs the microgripper? In Figure 1 are examples of those measurements. We used a Teledyne LeCroy HDO8108A oscilloscope for these measurements; the 10X attenuating probe is Teledyne LeCroy's PP023 500-MHz passive probe. The HDO8108A is smart enough to know when a 10X probe is attached to one of its analog inputs, and what it displays is the voltage at the probe's tip. So the oscilloscope has corrected for the fact that this is a 10X probe, and both traces are on the same 20-mV/div scale. As you can see in Figure 1, there is a comparable amount of noise pickup in both traces. With the tips open, the probes are more sensitive to electric fields. The 10X probe measured 72 mV pk-pk and 11 mV RMS, while the coax-only probe measured 36 mV pk-pk and 4.2 mV RMS. Figure 2 shows us the same measurements but with the tips shorted together. In this condition, the probes are more sensitive to magnetic fields. Yet, the noise component of the two traces is again comparable. This time, the 10X probe measured 33 mV pk-pk and 1.6 mV RMS; the coax-only probe saw it as 24 mV pk-pk and 1.2 mV RMS. As with our last post's RF pickup exploration, we know the source of the noise that's being picked up in these measurements (man-made RF, perhaps a defective clock in some nearby device). And as we learned, the answer to solving RF-pickup problems is proper shielding from the DUT to the oscilloscope's chassis. Figure 3 shows us the results of applying that proper shielding and taking the measurements with the probe tips shorted. As we might expect, just as in our RF-pickup experiments, there's virtually no noise on the BNC probe's signal. The 10X probe, however, is a very different story. Bear in mind that these traces are displayed on the same 10-mV/div scale (referred to the tips). 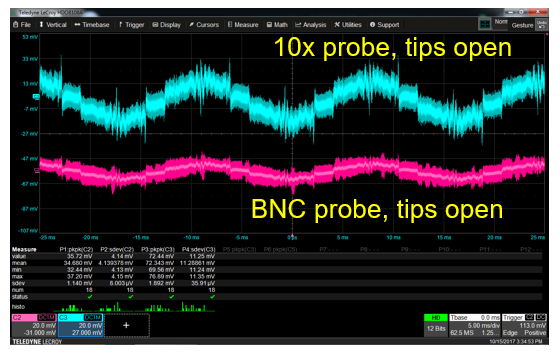 But the 10X probe shows 10X the noise of the BNC probe. 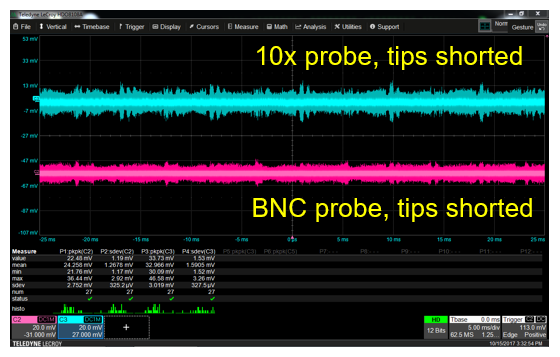 The reason is that both probes are seeing the same noise in the oscilloscope's amplifier, but it's being reflected by 10X at the tip of the 10X probe. 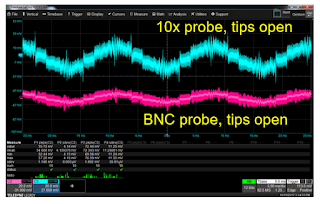 These examples show that if you're using any sort of 10X attenuating probe, and you're probing low-level signals at or near the noise floor of your oscilloscope, then you have effectively given away 10X the signal but have the same amount of noise. Your signal-to-noise ratio (SNR) is shot to pieces; you've lost 20 dB. Once again, the moral of this story is that with any kind of attenuating probe, you can expect to see a 20-db reduction in SNR. There are scenarios where you can afford to do that, so using a 10X probe is fine. But not for low-level signals, and not anywhere near the oscilloscope's noise floor.